Without hesitating, she accepted the Holy Spirit and all the messenger angel shared—fully and completely. Even though it was difficult and would change her life and the entire world, forever. This unknown gift, this unforeseeable path for her, she truly embraced. On a profoundly smaller scale, when I was in high school, I had an unforgettable experience where I felt I faced an unknown gift and learned to embrace it, too. I was about fifteen years old and in the throws of finding out about life. I wondered what to wear. I wondered how to act. It is a challenging age. I wanted to simultaneously fit in and stand out. I wanted to be unique, as long as I was not too unique. Everything seemed too big. Too hard. Too much. But I had a safe space. On Saturday evenings, I went to our youth Mass followed by Life Teen. It was the highlight of my week. After an intense school week, I found comfort in my circle of friends there. I learned about Jesus, His message, and how to be faith-filled in the world. I struggled with the message at times, but it shaped me in those years. But I had this weight on my heart. Samantha, I am sensing something in you. You have a gift. You have a gift of the Holy Spirit. You feel what others are feeling. You take on what they feel. It is a gift. Wait, what? A gift? I did not think it was a gift. I thought it was a curse. I did not want to feel the emotions of others. I was not ready for it. Over ten years later and I still remember what that kind friend said to me. I fought it for years. I rebelled against it. I tried to numb it. But finally, I have embraced it. I allow others to affect me—their joys AND their woes. I am still learning how to utilize this gift and I still wonder why it happens. But I accept that it is a gift. A weighty gift. I turned to Our Lady and reflected on what she endured and how her amazing gift of being the Mother of God changed all of our lives. 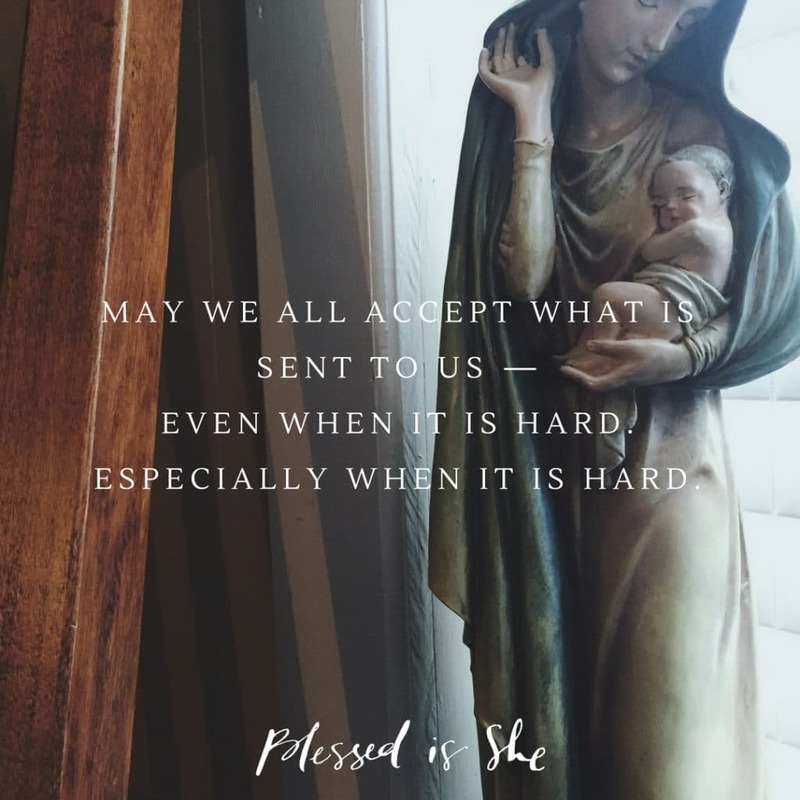 May we all accept what is sent to us—even when it is hard. Especially when it is hard. And know Our Mother has gone before us, sisters. Samantha Aguinaldo-Wetterholm is a wife, mom of two, and dentist currently living in The Bay Area, California. You can find out more about her here.